To submit a proposal, you are required to pre-register for the conference. To pre-register, please click here. Log in to the site with your AIS username and password. 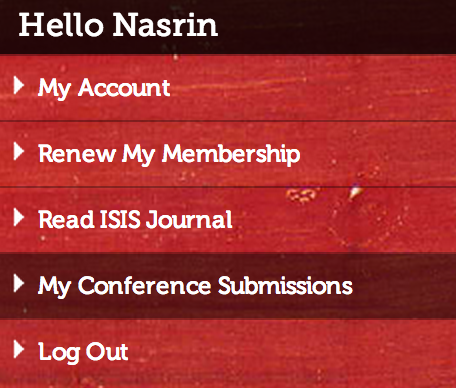 Once logged in, click on the 'My Conference Submissions' link on the left side. From there, decide if you are submitting a Paper or a Panel proposal, and fill the proposal forms by following the on-screen instructions. Independent PAPER PROPOSALS should include a bio of the presenter (a paragraph of no more than 200 words), and an abstract of the paper limited to a paragraph of no more than 400 words, outlining the central theme and main argument of the presentation. Convenors of PRE-ORGANIZED PANELS should submit a personal bio and a panel proposal outlining the central theme of the panel, and indicating how the individual presentations (mentioned in the order in which they are to appear) relate to that theme. The format and word count of the panel abstract are as those for independent paper proposals. Panel members must submit personally their own bios and abstracts, which follow the format of the independent paper proposal, but include also the title of the panel, which the panel convenor should convey to the presenters. Ordinarily panels comprise four presentations, but panels with three presenters will also be considered. In the latter case, the organizers may suggest to the panel convenor a fourth member, whose independent proposal is congruent with the topic of the panel. The Conference organizers reserve the right to edit bios and abstracts of approved presentations before including them in the Conference Program. Submission open on April 30, 2013, and will continue until June 31, 2013, 11:59pm Pacific Time-zone. Pre-arranged panels and independent paper proposals undergo a peer-review process by a Program Committee of scholars, whose names and academic affiliations will be published on the AIS website after the closing of the submissions process. All applicants will be notified of the status of their proposals in the fall of 2013, so that the approved candidates will have sufficient time to arrange funding through their institutions, or to apply for Canadian entry visas (where applicable). In compliance with AIS REFUND POLICY, reimbursement for the conference preregistration is available upon request until February 1, 2014. All cancellation and refund requests should be addressed to the Executive Director of AIS Prof. Rivanne Sandler, at director@iranian-studies.com. Membership dues are not subject to reimbursement.